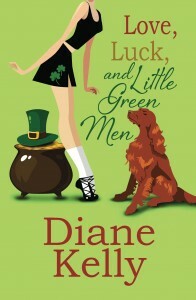 Diane Kelly » St. Patrick’s Day Romantic Comedy! St. Patrick’s Day Romantic Comedy! You’ll laugh so hard your shamrocks will jiggle! Love, Luck, and Little Green men is only $2.99 on Kindle and Nook, $8.99 in print. What fun this book was! Such a unique storyline. Enjoyed the mystery, the rainbows and fun. I HIGHLY recommend picking up a copy today! You won’t regret it!